* Cinema room - its amazing! Positioned perfectly on a south facing waterfront looking down the river - This large luxury home is the perfect family entertainer!! 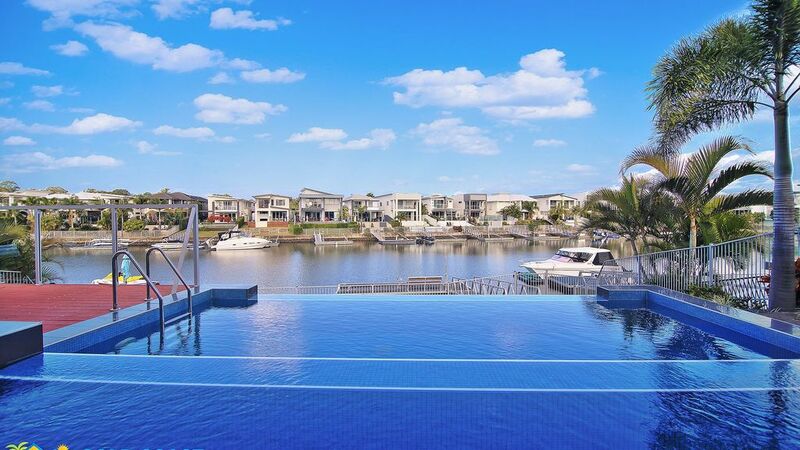 Situated on a wide waterway complete with your own jetty with stunning water views this 5 Bedroom 4 Bathroom home has everyone’s needs covered from the sparkling in ground south facing infinity pool to a state of the art cinema room complete with leather recliners to be enjoyed in full ducted Air Conditioning. Wait till you see the incredible in built aquarium that lines the entry way and includes two beautiful Lion fish. This is an ideal holiday home positioned very close to the Theme Parks and world class Golf Courses. Step down on the glossy tiles to the dining and kitchen areas to an expansive open plan living area with high ceilings then opening out to a dream outdoor entertainment area complete with outdoor lounge, 8 seater glass table and chairs plus a built in BBQ where you can enjoy the evening as the sun sets over the hinterland. The living area features a comfortable U shaped leather lounge suite with large flat screen TV and DVD player. Anyone for a Movie?? a purpose built state of the art 8 seater Cinema Room with Projector to show case a movie through the DVD Player, watch free to air TV or Cable TV on the BIG screen. Kick back on the leather recliners with cup holders and enjoy the complete movie experience in surround sound. The master bedroom is simply impressive with its own private balcony and water views. Featuring a spacious ensuite complete with his and hers basin’s, spa bath, a walk in wardrobe, flat screen TV and a double shower with amazing sprinkler head. The yard is very private, fully fenced and secure with an electric gate and off street parking for approximately 4 cars available. Amazing theatre room & views. The theatre room was the best part of this house. State of the art screen and speakers. Everyone loved it. Waterviews were stunning. The rest of the house needs improvement. The pool was very small because half of it is a spa which has been disconnected. I realise the pool can’t be made bigger but at least give guests the option to use the spa. The kitchen was very poorly equipped. Blunt knives made cutting anything impossible. The bedrooms were large but the wardrobe in the downstairs bedroom had a strange smell coming from the drawers. The upstairs bedroom drawers didn’t open properly and the en-suite shower in this bedroom was a challenge to use. Overall a nice property close to theme parks but we won’t be staying here again. We stayed for 7 days. Had a great time. Loved the pool, the boat ramp and the theater room. The house is spacious. Truly an entertainer. Loved our stay here. Close to theme parks. Spacious rooms. Enough room for a family of 7 without being crowded. Last week for 6 nights the kids, grandparents and I stayed at the Entertainer and we all had a FUNTASTIC time!. Everything about the place exceeded all expectations, just a minor hick-up with instructions on how to get into the house. After visiting the theme parks for a short time, the kids were keen just to quickly get home to become experts at fishing..some even caught a nice catch and cooked it on the bbq - definitely a highlight of this trip!. Hours of fun in the pool especially the games room, while the nights were spent in the theater watching movies. Grandparents thoroughly enjoyed their time out in this lovely home as kids did not once bother them as there too many activities going on at the home to distract them. Truly felt like home away from home. We will definitely be staying here again; highly recommend to large family. Thank you very much for a lovely extra long weekend away! We all had a fantastic time with so much to do! Love the swimming pool and the theatre room!